As you may already know, I am not that good at VBA and some offices don’t allow it to be used due to some security issues. 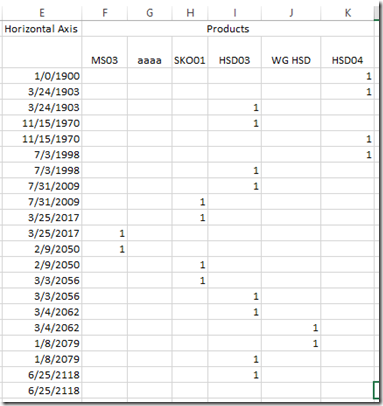 So I created a chart without VBA and a formula to set up the chart data series. 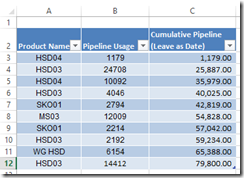 The main issue that we have with a stacked bar chart is that Excel puts a new color for every data point and it doesn’t know that a data point later in the series should have the same color as a previous data point. And even if you modify the layout, the Excel Stacked Bar Chart just doesn’t know how to handle it. So we need a new concept. 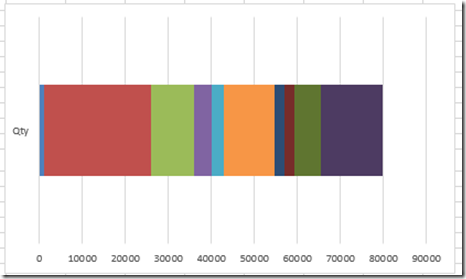 Like Leonid’s solution where he a Clustered Column Chart, we need to fake the eye and use a different chart type that when you finish tricking Excel, your final chart will look like a Stacked Bar Chart. My Choice is an Area Chart type. First the Height. If we look at the sample chart, all the segments of the stacked bar chart are the same height. It doesn’t really matter the height we choose as long as they are all the same. So, since it doesn’t matter, I chose a height of 1. Now the width. If we look at each segment of the stacked bar chart, each width is different and is representative of the pipeline amount. 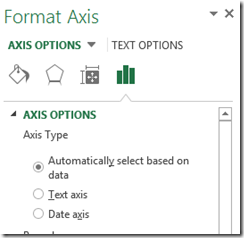 If we further dive into the horizontal axis of an Area Chart type in Excel you will see that you can have 2 types of Axes. 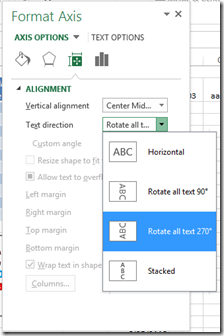 Your horizontal axis type can be either Text or Date. 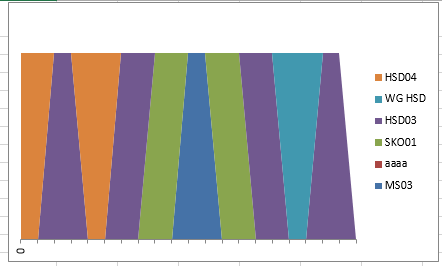 This is just like a line or column chart. If you choose the Text Type, each segment will be placed at exactly the same distance from one another and all look like they have the same width. So the Text Type of Horizontal Axis will not work for our needs as we need each bar chart stacked segment to be representative of the actual data in terms of width. 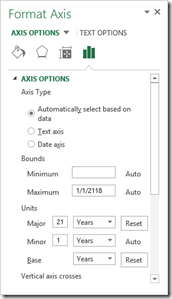 Therefore, we will need to use the Date Axis type in our Area Chart Horizontal Axis Options. It is not critical at this stage to represent the data as a date, but it will be in our final chart data range. The final step of the set up is that each Product needs its own column of data so that as the pipeline colors will match for each individual product. Here is how I set up the chart data table. 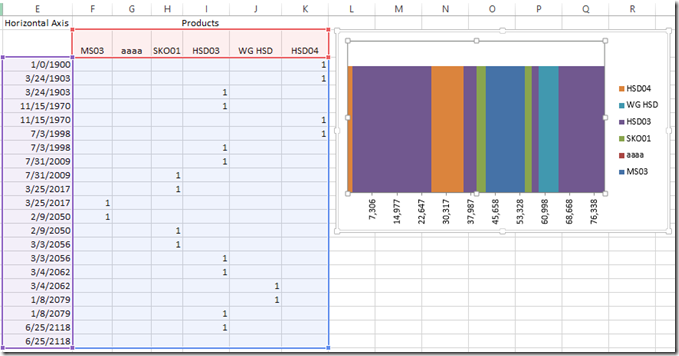 The horizontal axis formula is very similar to the one I used in the Step Chart posting. Both of these formulas can just be copied down if you data set grows. Notice how Excel connects the previous point to the next data point. 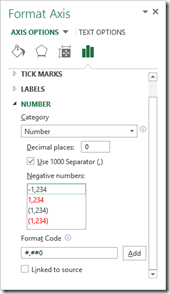 So make sure you keep your chart data range as a date and just adjust the number format of the chart. However, if you do want to use the number format in your chart as well, this is not a deal breaker as you can still lock the horizontal axis as a Date type and your chart will look right once again. 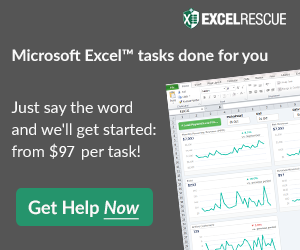 Have you ever used a Date Axis type to Trick Excel? 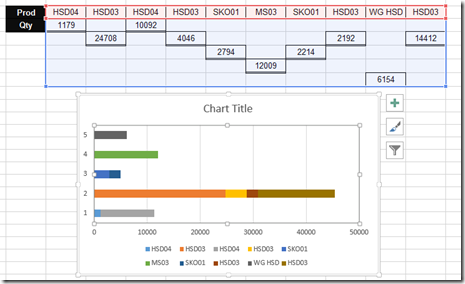 It a great idea to combine stacked area chart with the setup for a step chart.